Metal Roofing Archives - Beneficial Roofing | VOTED BEST Roofing Company, Call Us Today & See Why! Metal roofing has become a popular choice over the past decade. Why are metal roofs so popular? Why should you consider choosing metal if you are building a new home or replacing an old roof? 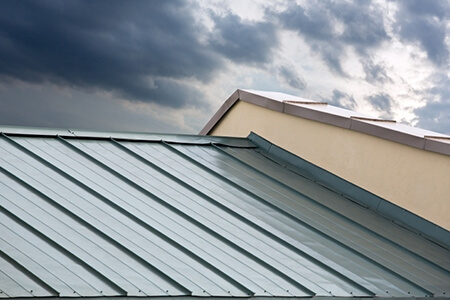 Let’s take a look at the benefits you can gain from having a metal roof. One of the main benefits of choosing a metal roof is its longevity. While most other roofing materials wear out within 15 to 20 years depending on where you live, metal roofs last 50 years or longer, even in the worst weather conditions. This means that once you install a metal roof, you may never have to replace your roof again in your lifetime. They require little to no repair and maintenance, making them ideal for anyone who values durability. Metal is highly resistant to all types of weather conditions. Unlike asphalt and some other materials, the metal will never allow for water penetration, regardless of aging. Water simply runs off. In addition, those living in snowy areas like finds that snow easily slides off their roofs, keeping it from building up. You can add that to the fact that metal roofs resist heat, and withstands high winds without damage. This makes a metal roof ideal for home or business owners in intense climates. Most metal roofs are now treated with a special, sun-reflecting paint. It makes these roofs incredibly energy efficient even in hot climates. And because most roofing companies guarantee that their roof paint lasts 25 years, you won’t need to repaint your roof in order to keep it energy efficient. While most people don’t think of a metal roof as being environmentally friendly, you should think about the 11 million tons of shingles that end up in landfills every year. You can easily see how having a long-lasting metal roof is extremely healthy for the environment. It reduces waste every single year. Another reason for choosing a metal for your roof is it increases the value of your home if you sell it. Because of the longevity and ease of maintenance, prospective home buyers know they won’t have to worry about replacing the roof right after purchasing the home. They, likely, won’t ever have to worry about replacing it. They know they’ll save money, during the time that they own the home, which makes purchasing your home a good deal. One of the main concerns people have is the cost. While metal costs more initially than standard roofing materials, you need to look at the big picture. Most other roofs need repairs every few years. These repairs are time-consuming and expensive. However, metal roofing will seldom need repairs, so that initial cost may be the only money you will ever put into your roof. In addition, if you plan on living in your home for 30 or 40 years, you can expect that you will have to replace that roof at least twice during your ownership. Plus, the cost of repairing it between replacements, which will end up costing more in the long run. It costs more than having a metal roof installed in the first place. So, it really is a matter of paying now or paying more later. This massive snowfall in most areas is a good reminder to homeowners the importance of having the ideal roof for the harsh weather during winter. Metal roofing are a great choice for people living in snowy areas as they shed snow loads easily. Though the weight per square cubic foot of lightly packed snow powder is very little, wet snow can weighs over 62 pounds per cubic foot causing many problems. The weight of the snow exerts pressure on the roof making it to bow downwards or sag. Some home owners may opt to rake the snow off the roof but this is only a short term solution. Raking also causes significant damage to the roof. Besides snow loads, home owners should also keep an eye on ice dams. Though icicles hanging along the eaves of a house look beautiful, they are a sign of trouble. This is because the same condition that leads to the formation of icicles; freezing weather and snow covered roofs also leads to ice dams, thick build up of ice along the eaves. Ice dams can loosen shingles, tear off gutters and make water to leak into the house. The best way to prevent snow loads and ice dams on the roof is to install metal roofs. First, they have a smooth top surface. When the sun shines, heat passes through the snow, heats up the metal and it is reflected back outside. This allows the snow to melt over the entire surface. The ice and snow melts from the bottom creating an opportunity for the snow to be shed faster compared to other roofing materials. Also, metal roofing is impervious to snow and ice because of its interlocking design and because the surfaces are slippery and hard. Another benefit is that metal roofs are durable. They last 40-70 years easily shedding snow, sealing out water and surviving high winds throughout their lifetime. If you are looking for the best roofing this winter, consider installing metal roofs. They are available in different styles to match any home or neighborhood. https://beneficialroofing.com/wp-content/uploads/2016/11/why-you-should-want-a-metal-roof-in-the-winter-2.jpg 1125 1500 user https://beneficialroofing.com/wp-content/uploads/2017/01/Beneficial-Roofing-Website-Logo-1030x427.png user2016-11-23 16:54:332017-05-18 19:01:12Are Metal Roofs Good in Winter?